← Around the World in 15 plates! MARRIOTT South Beach…which is right in the heart of the Civic District. You enter to be greeted by a huge floor to ceiling ever changing psychedelic wall mural. Shades of Austin Powers International Man of Mystery! Getting here is breeze because you can go the Raffles City MRT station…which is linked by an underground walkway to Esplanade MRT station. Once you come out of Esplanade MRT station on South Beach Avenue you are here. Well, actually about 2 minutes walk away to the main entrance framed by a very large and eye catching fountain which boasts changing colours at night! Spectacular! The Club rooms and suites are very comfortable and the contemporary decor boasts a lot of steel and glass. The blinds and curtains open and close at the touch of a button giving you great views of Suntec City and more. The bathroom has a big bath tub for soaking and posh Jo Malone soaps and toiletries from London, incidentally, they are made in England and Italy and NOT in China. The shower is very easy to use unlike some complex hotel showers where it takes some time to figure out how to even switch it on. The Executive Lounge for guests of the Club rooms and suites is titanic I kid you not. Here you enjoy complimentary breakfast, Afternoon Tea, Cocktails and Canapés and even has a full Bar! I like the Egg Station where Chef Mark makes eggs to order, a la minute. I tested him by ordering Spanish Omelette and Fried Egg East “easy over-over easy”. Chef Mark passed with flying colours. I really enjoyed coming here for some pre-dinner canapés and a glass or two of Taittinger champagne…and a Vodka Martini shaken not stirred, Ha! Ha! As well as Espressos and healthy Energy Bars throughout the day, and after working out in the high tech Gym on the 18th floor. Oh Madonna! I love this place! For fine dining Akira Back style there is the restaurant called …yes…AKIRA BACK! What else! You MUST dine here to understand the cuisine as The Travelling Gourmet TM always says, “Tasting is believing!” Wahahahah! 🙂 Sometimes, not always..but sometimes…less is more. Don’t take my word for it. Make a reservation and try the food yourself! Japanese modern cuisine with a Korean TWIST! Really YUM Yum Nom Nom!!! Believe me! Really good! The Chef is a former champion Snowboarder turned Chef! I kid you not. Never a boring moment in this avant-garde restaurant! Not to spoil the suprise but the Seafood selections are incredibly good! Stylo-Milo Sake selections to please and entice. Kampai! Super! I like the really cold water early in the morning when my trusty Breitling watch wakes me up at 06:00…and I go to the pool and Gym! COLD water makes your body BURN more Calories to keep our body temperature at 37C. Some like it cold…wahahah! Spectacular eagle’s eye views of the Padang and colonial Singapore…amazingly inspiring and beautiful! The Gym also has ALL the high tech machines you need and a mannequin for Krav Maga practice…Exercise every day to keep fit and strong! The other “Makan place” is BEACH Road Kitchen which0 has the most superlicious spectacular MEGA Buffet that is sure to fill you up with high quality products so you don’t need to eat for a couple of days! Maybe even a week..Wahahah! The Seafood section with Prawns, Lobster, Oysters and much much more is amazing! So too is the Dessert area with all manner of sinfully super sweet Scrumptious SUGAR laced treats like Macrons a la parisienne, Waffles, Ice Creams, French Patries, Cakes and lots more! OMG! The Roast Meats are is super-yummie too as is the PIZZA. 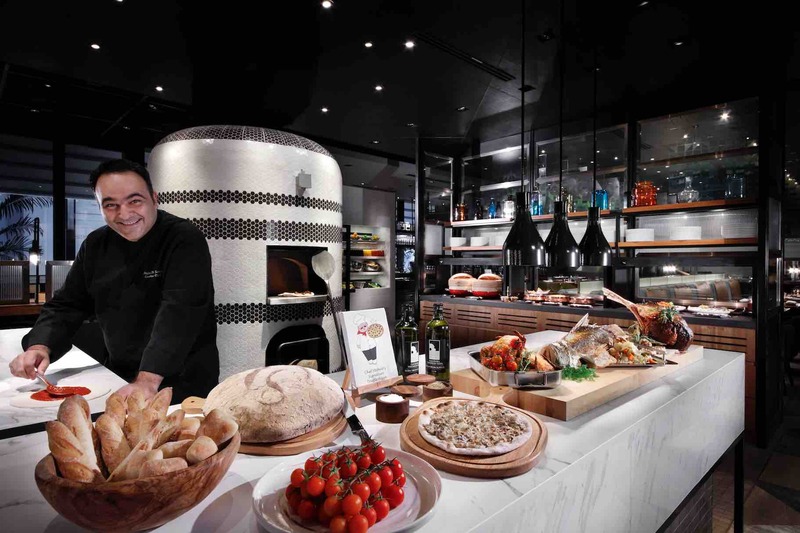 Mio amico the Executive Chef Stefano and his yummies…in back is the Pizza Oven and at 1700 is the Spezialitata di Casa…Pizza…. :-) Buon appetito amici! There is a speciality Pizza which you must try. I am not going to tell you…just go and ask for the Chef’s Special Pizza! Believe me it is to kill Kim Jong Un the north korean evil dictator for! One very amusing fact is that the cheerful General Manager is named Flint…Derek Flint. He explained with a cheeky chuckle, “My parents went to watch the hit movie “Our Man Flint”. The hero was called Derek Flint…they loved the movie and named me after him!” For thos not familiar with this cult movie, James Coburn played super-spy Derek Flint who could communicate in numerous languages, was a Karate expert, a fencer and much much more! Derek Flint was the spy who out-bonded Bond! Wahahah! This entry was posted in Art, Chocolates & Desserts, Fabulous Food and Gorgeous Drinks, Fabulous Food, Gorgeous Wines!, Food and drink, Gourmet cuisine, History, Hotels & Resorts, Let them eat Cake..., Travel, Voyages and tagged Beach Road Kitchen, Civic District, Dr. Michael Lim is The Travelling Gourmet TM, Esplanade MRT, JW Marriott South Beach. Bookmark the permalink.